8 pages. Volume 4, Number 14, dated August 1, 1978. 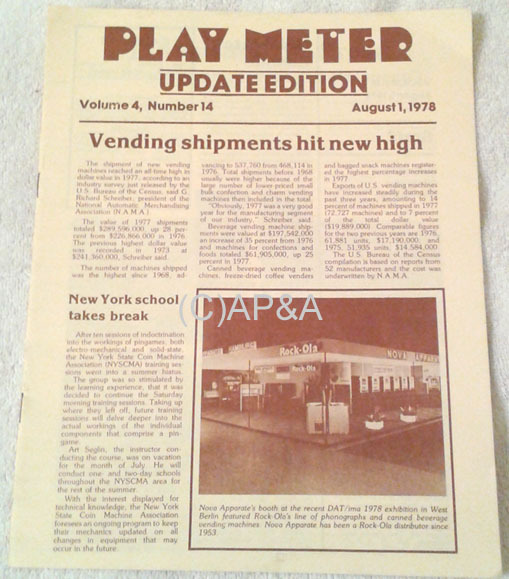 Newsletter / bulletin originally mailed-out to amusement game operators, providing updated info about the coin-op industry. A great historic insight to the industry of the time. This edition includes information about the pinball tech school of the New York State Coin Machine Association (NYSCMA), stats on sales of vending machines hitting record highs, schedule of Atari tech schools for the time period, pinball in the press, national amusement Operators show/convention schedule, tech info and tips, classified ads, and for juke box operators- a listing of the top 100 record/singles- pop, soul, and country for the time ("Shadow Dancing" by Andy Gibb being listed as the 7th week at the top position).